(From Nikon lens literature) Ready to go everywhere. The 1 NIKKOR AW 10mm f/2.8 has all of the features of the original 10mm f/2.8 lens, plus waterproof and shockproof construction, making it perfect for landscapes, underwater scenes, portraits, and low light occasions. With an f/2.8 aperture, the 1 NIKKOR AW 10mm f/2.8 provides fast shutter speeds and softly blurred backgrounds for portraits. 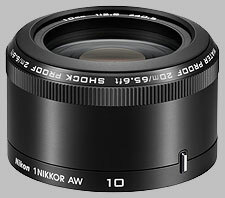 The Nikon 1 10mm f/2.8 AW Nikkor doesn't have any user reviews yet!